I’m taking advantage of the hours sitting at a swim-meet (when my daughter is waiting to swim) and reading Jimmy Moore’s Keto Clarity, which describes a better healthier Atkins-esque low-carb diet. About a third of the way through, I’m kinda realizing eating right isn’t as complicated as all the books make it seem. Many more chapters to go, but if I just don’t eat the “luxury” items, like cookies, pop, beer …pretty much the stuff I know isn’t needed to keep me alive, I bet I’ll feel healthier – always. 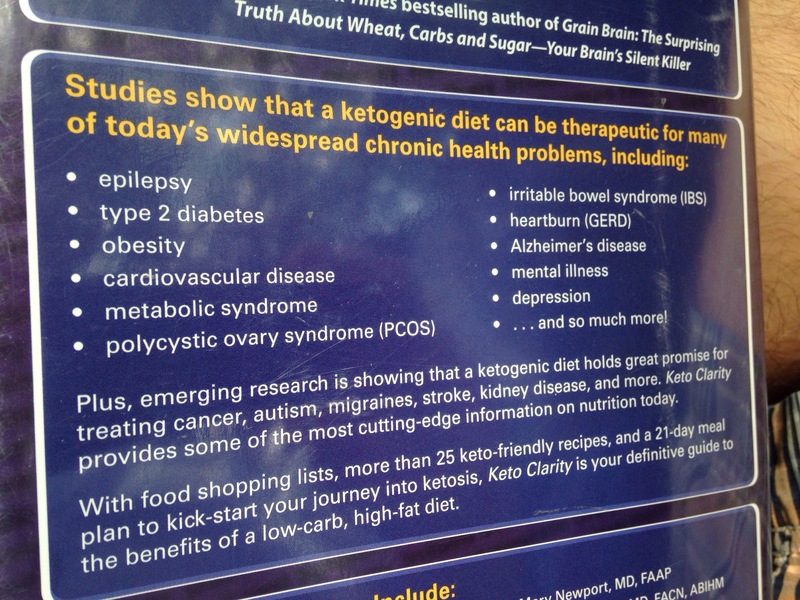 So why “keto” (which is what people on ketogenic diet plans call it in slang)? Because it’s been said to ward off Alzheimer’s, depression, cardiovascular disease, and help with better sleep and breathing. That is the full list of things I worry about and fight to avoid. So I’m reading the book.